VPR’s Susan Keese visited their studio and has this explanation. (Keese) The park bench in Erik Newquist’s shop isn’t like any you’ve seen before. The bench resembles a xylophone. The sturdy slats of white cedar that alternate with a darker wood. Imagine a look something like an oversized piano. The whole thing is a little more than six feet long and it curves slightly into the shape of an S. The bench is dotted with metal knobs, each of them attached to a metal striker hidden underneath the bench. The slats actually serve the purpose of a piano’s keys. They’re arranged by size – longer to shorter and shorter to longer, depending on which end you’re sitting on. (Jones) "So the longer it is, the lower the note." (Keese) That’s Garry Jones. He describes himself as a musical sculptor. He and Newquist, a metalworkers, are the co-creators of this innovative bit of public infrastructure. Jones is a native of Australia, married to a Vermont woman. He’s built interactive sound sculptures in many different countries. And he’s made it his life mission to get people – especially unlikely people – playing music. (Jones) "And the idea with this is that somebody would come along sit down and go, ‘Oh my goodness! That does something.’ And they’ll explore it. And when they get back here they’ll discover that it actually makes musical sounds. And then hopefully somebody else will come along and they’ll explore it together." 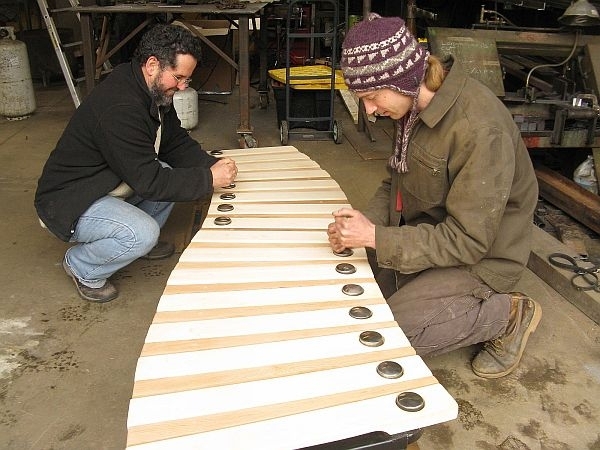 (Keese) Jones and Newquist hope to get ten musical benches installed around Brattleboro, eventually. The town’s municipal arts committee has endorsed the plan. Kate Anderson is the committee chair. (Anderson) "This is fabulous. It does exactly we’re trying to do — to create more dialogue within the public sphere using the arts as a vehicle. " (Keese) Unfortunately, Anderson says, the town doesn’t have the money to pay for and install the benches. They cost at least $3,500 each – and Jones says that’s a special home-town deal. (Jones) "If we sell them to another town, they’ll be $5000." (Keese) Newquist and Jones are currently seeking donors to adopt and pay for the benches. It’s an idea that’s worked in New York’s Central Park, and other places around the country. The benches got some exposure from the Windham Orchestra. The group incorporated two musical benches at a weekend concert. Hugh Keelan, who conducts the orchestra, called up children from the audience. (Keelan) "This is art and music for the people… I mean it just really is." (Keese) Meanwhile Jones, who’s also a composer, is working on a concerto for strings and park bench. He hopes it will premier on the Brattleboro town common this summer. For VPR News, I’m Susan Keese in Brattleboro. Our region was saturated with sunshine and hot days recently, causing green shoots to burst up from the soil. But it’s only March, and gardeners are speculating whether snow will fall again before spring is over.